When Horace Welburn Pulham was born at the end of 1868, his parents were living in Burnham, Essex. At that time his father William was employed as a grocer. 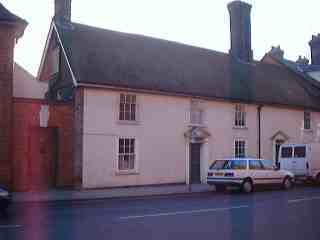 In 1881 at the age of twelve, Horace was living with his parents at 25 Blomfield Street, Bury St Edmunds. This is a modest, small two storey end terrance house with a cellar/basement. At that time his father William gave his occupation as a commercial travelling draper. It must have been rather crowded in the small end terrace house, for Horace's uncle Fredrick Pulham and his aunt Elizabeth Welburn was also living with the family. Number 25 is the last house on the left hand site of the map (just above the letter 'a' of the word 'map'). When the Pulhams lived there, they would have looked out over open countryside as this road was on the very edge of the town. Two years later, Horace's father was still a travelling draper according to the 1883 Suffolk edition of Kelly's Directory. 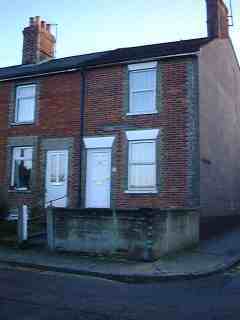 Business must have been good, for the family had moved to a more substantial house at 7 Westgate Street. This is in the better part of the town just a few hundred yards from the Abbey. You can see number seven on the map. It is next to the theatre and directly below the 'R' of Westgate Street. The family were still living in Westgate according to the 1885 edition of Kelly's Directory. By this time, Horace's father occupation was now as a 'Commercial Traveller'. 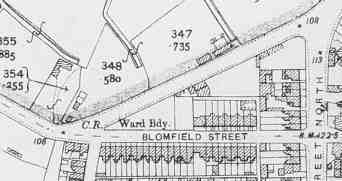 By 1891, the family had moved again for they were not listed as living at 7 Westgate Street at the time of the census. Horace married Martha in Lincoln on 4 November 1890. Martha was a widow almost ten years older than Horace although on the marriage certificate she gave her age as only five years more than the groom. 9 January 2000: Kelly's Directory of Bury St Edmunds, Suffolk: 1846,1875,1879,1883,1885,1892 editions. 10 January 2000: Kelly's Directory of Suffolk: 1869, 1873, 1874, 1888.